Have you ever wondered what it would be like to choose to face each day with a sense of wonder? I recently had the privilege of spending a week with my granddaughter, Tatum. We were celebrating her 5th birthday and took a trip together – just the two of us. We went to a place that was familiar and comfortable for us both – but we had never experienced it without other family members present. It was magical. Wonder why? We were together – with almost no agenda – where Tatum was given the opportunity to make choices and I was able to be with her and watch her enjoy the fruits of her freedom. Whether playing on a playground, on a beach, at an amusement park, reading a story, playing a board game, shopping or simply walking down a street. I observed the sheer pleasure of presence – total engagement in the “now”. There were times when I could almost watch her mind working on navigating the next move – and it was wonderful. There was joy in creating memories together. Ellen Langer’s most recent book, The Power of Mindful Learning, (which I am currently reading and began after returning home from my time with my granddaughter) encourages the reader to be open to wonder and curiosity rather than being certain or limited by previous experience or “expert” advice . By looking at circumstances with a fresh, new and/or different perspective, we are given the opportunity to enlarge our life experience and explore possibilities. This is what I observed and experienced in my 7 days with a 5 year-old: wonder, curiosity, freshness, enthusiasm, kindness, generosity, novelty and so much more. Yes – we went to a familiar place. 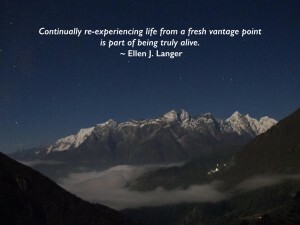 And experiencing it from a “fresh vantage point” made me feel truly alive – and wonder-ful.